“I have little sympathy for the Republican Congressman who got shot today because he viciously opposed President Obama’s effort to reduce gun violence and instead, he accepted more gun lobby money than all but 15 other members of the House of Representatives,” he said on Facebook. The comments drew criticism from others who follow Devine on Facebook and Twitter. 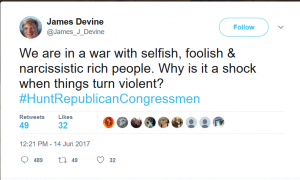 But Devine told New Jersey 101.5 that he is not backing down, although he insists his comments were meant to shock but not advocate violence. “It is insensitive and I don’t care. You want me to be politically correct? I don’t have time for that anymore,” he said.